about public service, not commotion. “Politicking at the container is never called a politics. think before you speak,” the prime minister remarked addressing the groundbreaking ceremony of Shorkot Khanewal section of M-4 Motorway between Multan and Faisalabad here. He said he always remained extra carefull in selection of words, contrary to a opposition party which used derogatory language. It also used improper words during its electioneering in Azad Kashmir elections but people showed maturity and outrightly rejected this `dirty’ politics, he added. the ceremony, besides a huge public gathering. The Chairman NHA briefed the prime minister on 65-kilometre section of Shorkot-Khanewal Motorway that would be completed within 20 months, costing Rs 22 billion and mark the completion of 240-km M-4 Motorway. between southern port cities of Karachi and Gwadar with the north of country. Besides boosting trade, the motorway would reduce transportation cost and time from the textiles hub Faisalabad in Central Punjab to Multan – a major trade centre of Southern Punjab. The NHA chief said Shorkot-Khanewal section was divided into two packages including Shorkot-Dinpur (31 kms) and Dinpur-Khanewal (34 kms) to ensure its timely completion. The prime minister said they (PTI) were not getting any support for their much-trumpeted movement because the people needed only the politics for progress, prosperity and alleviation of poverty and literacy. from the contracts of three LNG-based plants. audience about the countrywide network of motorways worth Rs 850 billion, being developed by his government. taken a turnaround with record high foreign exchange reserves and established currency value. Even the international institutions and reputed international newspapers and magazines were also acknowledging this positive trend, he added. Prime Minister Nawaz Sharif said whole country including Balochistan, KPK, Sindh, AJK and Gilgit-Baltistan would benefit from the road network, being developed under China Pakistan Economic Corridor, which was an unprecedented gift from China worth US dollar 46 billion. the prices of fertilizers would be further reduced for uplift of the agriculture sector. here, but from China border,” he said. including the steps being taken to overcome the gas shortage. The government was not thinking of just for 2018 or next election but it was thinking for next fifty years, he added. international city by developing a port or an airport. development projects and prayed to Allah Almighty to protect these from an evil eye. The M-4 motorway will comprise four interchanges at Din Pur, Makhdoom Pur, Kabeer Wala and Khanewal, besides 16 bridges and 112 underpasses. 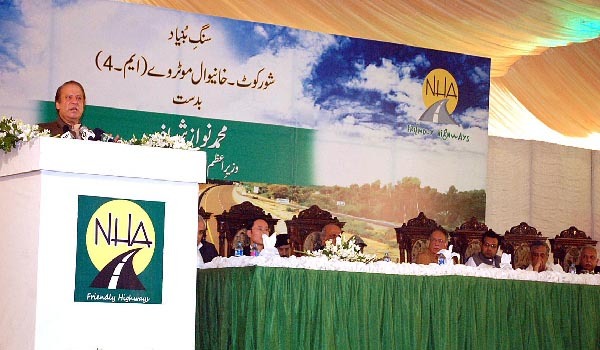 Secretary Communication Khalid Masood Chaudhry, in his welcome address, said the Shorkot Khanewal Motorway would be developed as four-lane road and take 20 months to complete. motorways by three times within three years and added that the CPEC would not only change the fate of Pakistan but also bring prosperity in the whole region. Sahibzada Nazeer Sultan, MNA also thanked the prime minister for launching the project in the area and congratulated over his complete recuperation. vision of countrywide road networks that would usher a new era of progress in the country. Besides, he also drew prime minister’s attention to some of the issues in his constituency.